Are you Sharply Focused on Revenue Growth? Does your annual revenue fluctuate? Are you winning less than 60% of your proposals? Is your Government market niche stagnated or declining? We follow a customizable Six-Step Approach for achieving Revenue Growth. 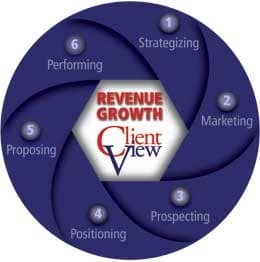 These Six Steps are parts of a continuum – the activities in one inform the next – and each is essential for successful Revenue Growth. …and How we do it. Augment Your Team – need access to a new agency? conducting market research for a new product? help with a proposal? or help implementing/understanding new contract requirements?